GET READY FOR THE HAUNTING TO BEGIN! 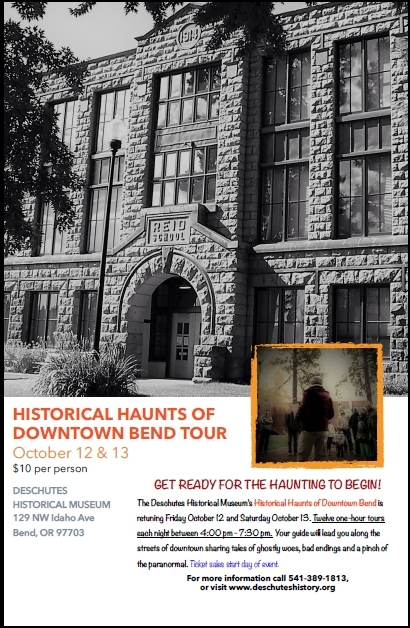 The Deschutes Historical Museum’s Historical Haunts of Downtown Bend Tours return for 2 nights only, October 12 and 13. Twelve one-hour tours offered each night with the first tour leaving at 4:00pm and the last leaving at 7:30pm. If you missed this fun event last year, bring your flashlights, comfortable walking shoes, and plenty of nerves, as our tour guides lead you along the streets and alleys of historic downtown, telling tales from the town’s past and weaving it with a pinch of the paranormal and mystery of the unknown. Tour space is available on a first-come, first-serve basis. Ticket sales begin at 10 am day of the event. Cost is $10 per person and $5 for Deschutes Historical Museum Members. Children 12 years and under are free. Tour fee includes museum admission. All tours begin at the Museum and end downtown Bend. Please note: as many featured locations are operating businesses inside, tours do not enter into any buildings. Hot chocolate and apple cider will be available.